Candles and tea lights are a popular way to create a relaxing and pleasing ambience in our homes, scenting our rooms and giving an atmospheric glow to cold winter nights. Place scented candles in a suitable glass or metal container that can withstand the heat of the liquid and will not leak. Scented candles turn to liquid in order to release their fragrance. Christmas trees, plants, flowers or other foliage. Curtains, other fabrics or furniture. Ribbons, greetings cards and other decorations. These could easily catch fire. Out of the reach of children and pets. Remember to keep them away from clothes and hair. If there’s any chance you could forget a candle is there and lean across it, put it somewhere else. Put out candles before you leave a room and before you go to bed. Keep a battery operated light or torch handy. 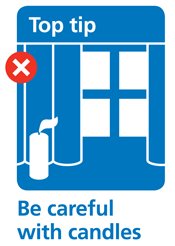 If you have to use candles or matches take extra care, never leave the unattended. Make sure they are out before leaving the room or going to bed.